Now don’t think I have been drinking by reading the title of this post. The Bafana game against Cape Verde was anything but exhilarating and in fact ranks quite highly in a list of uninspiring tournament opening games. However, what this post is about is the experience that I got to undertake on Saturday 19 January to mark the opening of the AFCON. 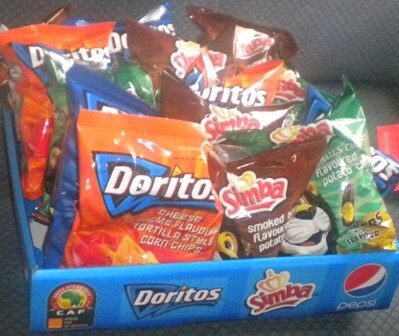 Pepsico, official tournament sponsors and company that gave us tickets to give to you the readers, decided to take a view members of the media on a social outing to experience the opening from a different point of view. Now as you can imagine I get invited to a fair few of these things, but quite often alone, on the day however, I was able to bring my brother along and we embarked on a rather exciting adventure ourselves. 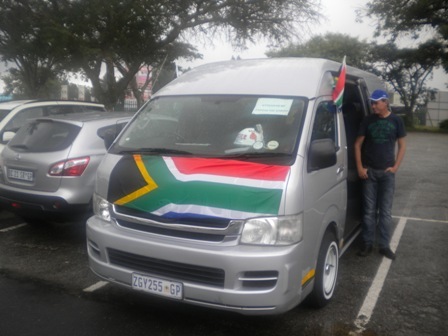 Upon arrival at the meeting point, two things were immediately apparent, one that we were a group of proudly South African supporters as the taxi was covered in South African flags and the second was that we were not going to go without on the day as inside the taxi was Vuvuzelas, Thulazelas (earplugs in wrist bands), Makarapa’s showing the sponsors logo’s, Pepsi’s, and a range of Simba and Dorito chips. I met a few of the others and we started getting into the vibe on the trip to Soweto. Upon arrival in Soweto we had a tour guide who was a great mix between fact and fun and pointed out some of the good jols to hang out at. We went through to the Shack Shebeen just off of Vilakazi Street (That famous street that housed two Nobel Prize Winners), where we were told that beers came in only one size, Quartz. While settling down with our castle lite, we were then told we are making our own Makarapa’s. This was a completely novel and new venture for me and one that reminded me that my artistic ability is as limited as Bafana’s goalscoring ability would be that night. From the Shack we ventured to Chaf Pozi, a Shisa Nyama in the shadows of the Orlando Cooling Towers. This place is awesome. With easily 500 people in attendance there was dancing, singing, drinking and importantly eating as we awaited the kickoff of AFCON 2013. It was a vibe worthy of a victory and although Bafana disappointed on the day, the experience didn’t. 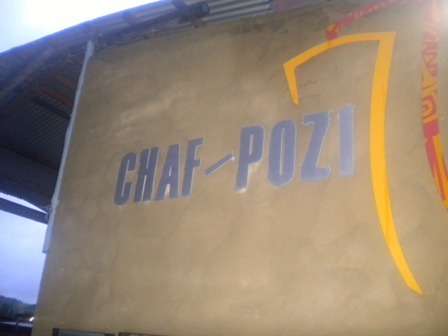 If you have never been to Chaf Pozi, I recommend it highly and check out their website here. 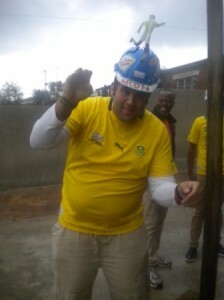 Bafana didn’t get off to the perfect start in the AFCON, but that couldn’t dampen an incredible day for me. Special thanks to Lerato Mnguni and Michelle Berman from Atmosphere Communications for making this day the awesome that it was.